University apologizes over email urging Chinese students to speak English on campus. 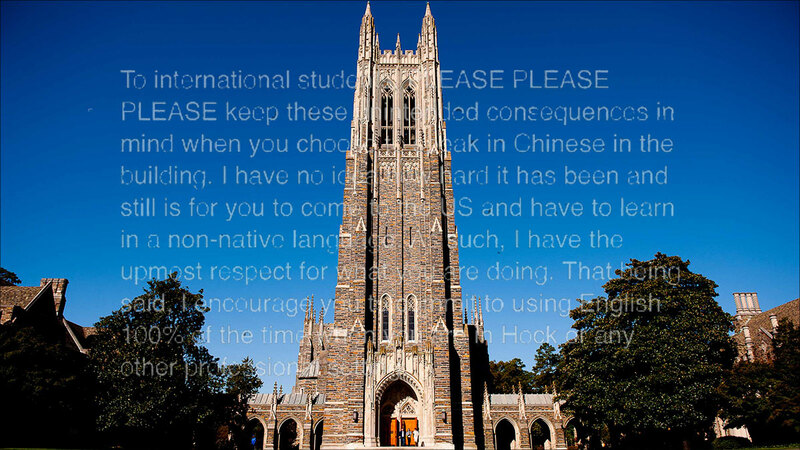 Duke University has apologized after a professor sent an email cautioning international students against speaking Chinese on campus and urging them to speak English instead. The professor, Megan Neely, said in the email that two faculty members had come to her office complaining about students speaking Chinese "very loudly" in the student lounge and study areas. The faculty members wanted to identify the students and write down their names in case they sought to work with them in the future. "They were disappointed that these students were not taking the opportunity to improve their English and were being so impolite as to have a conversation that not everyone on the floor could understand," Professor Neely wrote in the email. "To international students, PLEASE PLEASE PLEASE keep these unintended consequences in mind when you choose to speak Chinese in the building." The email, unsurprisingly, was widely circulated on social media. Professor Neely has since stepped down from her role as director of graduate studies in the medical school's biostatistics master's program.